Cynthia Hayter: https://m.facebook.com/chayter516 you won the cross. Casey Taylor: https://www.facebook.com/casey.taylor.75286 you won the apron and tea towels. What I’m going to do is choose two winners. One will win the cross, and the other will win the apron and tea towels. Leave a comment on this post telling us which of the two prizes you’d like to win (or either). Also, include the URL to your facebook page where you shared our news about the book. This giveaway will only stay open until Sunday night November 12, 2017, at which time I’ll randomly choose two winners. One will receive the cross, and the other will receive the apron and tea towels. I’ll announce the winners right here in this post. I’ll also try either emailing the winners if I’m able to access their email through the comments or I’ll send a message through facebook messenger. Click here to find out more about our book and our upcoming study later this month! I love both the cross and the apron, but my first choice would be the apron. I cook at a community dinner and this would be wonderful to wear then. I would love either prize so I will let you choose!! Love you studies and looking forward to this one. Second, the cross, I can add to my prayer room. Thank you. The apron is beautiful! Thanksgiving is my favorite holiday…. No commercialization! This would be perfect for the holiday that’s only about family and thankfulness! I love your sight! I receive your daily Marriage prayers e-mail and love going through the Bible with you. The gifts are all so beautiful! I absolutely love the cross…but my heart is in the kitchen. So I think the apron or kitchen towels would be a wonderful addition to my home! Thank you for your ministry! I love both prizes. I think I would love to win the cross. Thank you for a chance to win! Posted on Facebook! I would love the apron and tea towels, although I would be happy either way! I emailed it to my friends. I would love to win the cross. Posted on Facebook! I love the cross, so I think that would have to be my pick. I would love to win the apron & tea towels, I love aprons too and one can never have too many. I like the apron and the tea towels. So pretty! I don’t have facebook but I did share through email. What a great idea! I would love to win either of them! We are in the long process of remodeling our home (it feels like a constant “under construction” sign should be on our door) so new decor for the wall or a new apron for the kitchen would be great! I love the motivational emails I get every morning, so encouraging! I love the cross, I would hang it in my office at work so all who enter would be reminded of what a Great God we serve. Blessings! Thank you for all you do for the Glory of the Kingdom of God.Thank you for a chance to win these beautiful items.Both of them are really beautiful.I would love to win the cross.It would be a lovely addition to my home.Iy all began at the cross we have to take up our cross daily;and die to ourselves.A perfect reminder every day of what Jesus did for me and you.To be able to share with friends and family.God Bless You. All three giveaways are awesome! If I had to pick one it would be the tea towels. I love both and I think this is very nice of you to do this! I don’t have facebook I sent it via email. You are so encouraging and for some reason the things I read seem to fit in my life situation at the time. Shared on Facebook. 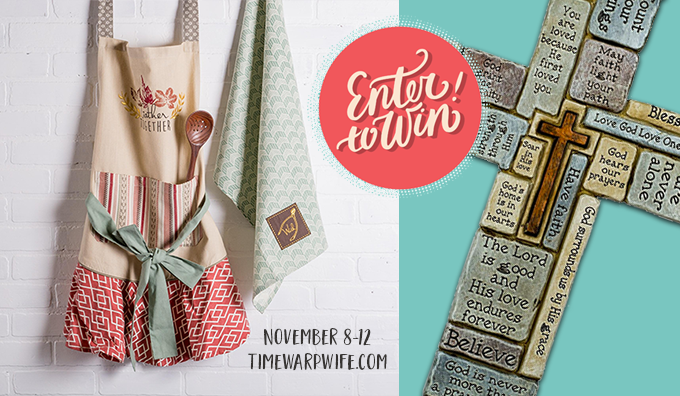 The cross and the tea towels is what I’d love to win!! 🙂 Thank you!! I LOVE both…..I bake for family, so either one would be great! I love your bible studies, it allows me more study time in the word. Thank you for doing this! Hi, I would love the cross for my prayer closet. I don’t know how to do the url off of my phone, but Facebook is Judi Rhodes where I posted the link. I am super ecstatic about this study. I do not know much about the feasts, so truly a learning study for me. I love both the apron and the cross. Thank you for the daily motivational scriptures! I would love either of the prizes. I LOVE getting your emails everyday! Thank you for your daily reminders and inspiration! I really like the cross, but the apron is lovely as well. I love both but leaning more towards the apron. Thanks so much for your encouragement every day. What an awesome cross. I’ve never seen anything like that. Good morning. Id love to win either or. The cross to help my daughter build her own prayer closet for her birthday. And or the apron because at our house ww all love to have company over and cook for our family and friends. I love your books and ministry! Thank you! I like the cross but either one would be nice. I shared on my page https://www.facebook.com/catherine.smithoakley?hc_ref=ARTk-Ida2F6bryhKOhyvU4JXiI-ywvCaYMF8SUTaNqdK11jgzVRzNrFkS_QL7Te0oAc&fref=nf I’d love the apron and tea towel set – so adorable! They are both beautiful and very nice of you to give away! I would love the apron though. I am always in the kitchen cooking and love aprons myslf. This book looks wonderful! Either of the giveaway items would be great, but the cross is my favorite? Thanks! I love the gifts and mostly love the devotional prayers i receive daily and than i pass along to all my married friends so they can truly be encouraged daily. Anyone of those gifts would be amazing. God bless you all for what you do and for obedience to His word. I absolutely love that cross! I hope I win it! I love the apron. I shared twice but I’m not sure what my Facebook url is ? Posted to Facebook! I love love love the cross!!! And I cannot wait to read the book 🙂 Thank you for the give away! I really like all the items but, I love aprons! I would appreciate either, but I love the cross a lot! I love that cross, but winning anything is exciting! Posted on Facebook. I would like either. I have done several of your bible studies and have enjoyed them so much! Thank you for your willingness to serve the Lord and share your gifts with us. I like the word cross. I enjoy your daily marriage prayers and have sent your links to others who were getting married or were. I would like the apron and tea towels. I love your site, your encouragement, and commitment to Christ. I have the book and study guide. Just waiting to get started. I would like the cross! But the apron would be fine too! Love the color of the towels! I hope to read the book soon! I really do love the cross, but the apron would also be nice! I so enjoy your site and the studies. I use them in my ladies bible study on Wednesday mornings! Thanks for every thing. I’d love to win either prize, but I really like the cross!!! I love them both, so it’s a tough choice, but I really love the inspiration written all over the cross! I posted your paragraph on Facebook, but I’m really looking forward to getting a copy of the study! I shared the post on Facebook (https://m.facebook.com/melinda.kyhn). I like both prizes but I prefer to win the apron and tea towels. Thank you for your ministry. I copy & pasted to facebook. I love both gifts, the cross is my favorite! Thank you Darlene for your wonderful site and all your dedication to Bible Studies for us. They are so meaningful to me. Seems the right things I need just when I need them. I posted on FB! I have enjoyed your website for Bible study. I am currently working on your series on Galations. I would love the apron and towels! Thank you for all your time and effort that you put into this website for us!! Would love the apron. But would also be happy with the cross. Both are awesome. Shared on Facebook. I would love to win any or all of these items. Beautiful!!! My choice would be the apron but either would be great! Love your website!! Thanks for all the work you do, it is a lift sometimes when I need it! This last year has been so difficult, lost my dad, then my newborn son (8 days old) and discovered another hard secret that I am dealing with. So on hard days I look for inspiration and I often fall on your website!!! Would love either of the prizes. Don’t have a Facebook at the moment (a mutual agreement between the husband and I) but have forwarded the paragraph to some of the ladies in my Bible study at church, and some of the other ladies in my support groups! Both prizes are absolutely fabulous, but I like the Cross the most. I am in the process of creating a War Room and the cross would be perfect in it. I would love the apron or tea towels. I can’t wait to read the book! I find the feasts so interesting! I love the cross and the apron, but the apron is so cute so I choose that. I have not bought the gook yet, but I will hopefully this week. 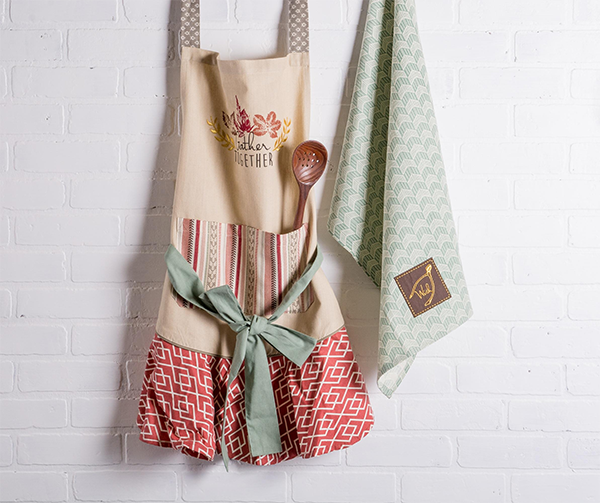 I love the gather together apron. My 10-year old granddaughter and I prepare Thanksgiving dinner for the family and I would love to wear this. Hi I would be grateful for any of the prizes. I do have a collection of various styles of crosses and this one would be great. Thank you for your faithfulness and ministry. This is so sweet and generous of you to do a giveaway. I honestly would enjoy either of the 2 of your favorite things! So I will the apron and tea towel set please. Thank you again! I’m not finding a place that get the FB URL on my phone but I posted as Julie Long Donahue or Mom2Ways. You should have three dots in the upper right corner of your post. If you click on them it should give a drop down with “copy link” as one of the choices. Copy it come back and paste on your reply. Both Gifts are beautiful either or would be very nice. If I had to pick I would Love to win the cross. Just shared it on Facebook! Love both giftys but the apron catches my eye atm lol. Thank you for your dedication to your calling, providing study material for us. I would love to have either of the gifts. Thank you. I have posted to my facebook page, but not sure what my URL is. I would love to win any of these lovely gifts. Thank you for the opportunity. I just posted the link to my FB page (https://m.facebook.com/story.php?story_fbid=10214848923753913&id=1151204512) & was recently telling someone about Messy Beautiful Love, that I’m currently reading. Love your work and encouragement! 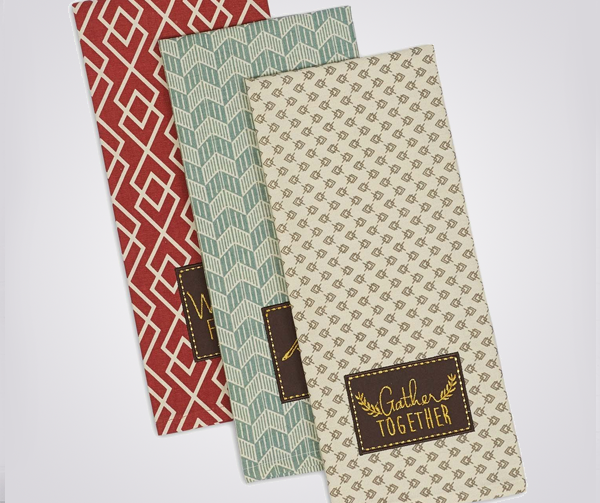 I just adore the Gather Together apron and tea towel set. I, too, love aprons! Good luck everyone. Blessings! I would love either gift if I was blessed to win. I posted the link on my FB page and I have the book and study guide I just started working through it. So excited for this book. God Bless! Where do I put the private URL? I would love to win the Cross. Would love to win the cross and apron. Thanks for running the contest. If my name is chosen, I would enjoy the word cross. Thanks! I love all of them, but my favorite would be the cross. I fell in love with the cross the first time you posted it on your page. I’m in the ‘you choose’ group as I can’t decide which I like more. Here’s the URL where I posted about the book: https://www.facebook.com/cari.mancari.shepard?fref=nf&pnref=story (can’t figure out how to just grab that post). I would love either, however, I am an avid lover of and collector of aprons!! I have even made my own when my beloved grandmother was still alive!! The apron and tea towels would be a blessing!!! Thank you so much for your blog, Bible Studies, give-aways and honest love of witnessing for Christ in an oft troubled world!!! I have really enjoyed your studies of the books I’ve read so far. Congrats on your new book, it sounds inviting to study as well. Thanks for this opportunity to win, I think I would prefer the cross over the apron just because it’s such a great daily reminder of how much Christ’s Love is for all of us each day. Shared. I would prefer the apron and towels. Thanks for the opportunity and great blog. would love the apron but either is great with me!! thank you so much. I would like the apron and towel or 3 tea towels. I also shared in Facebook: https://m.facebook.com/story.php?story_fbid=10215027257938869&id=1352582246&ref=bookmarks. 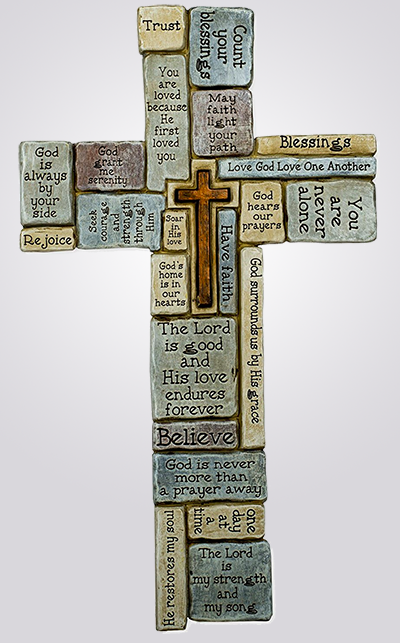 Love, love the cross, it would look absolutely beautiful on my cross wall. Awesome apron and towels, so either would be fine with me. I would love the cross as an addition to my War Room (prayer room). I posted to my Facebook page however, I don’t have a clue how to find the url address. The cross is lovely. I’m still quite new in my journey along the path and am grateful to the guidance and ease of studying the Bible in a different and stimulating manner. Adore the words cross but the apron and tea towels are so sweet too! Thank you for the contest❤️Looking forward to reading the study!! I would love the cross or towel set. Thank you for this amazing giveaway & for your timely & encouraging posts. I would love the cross if I win. It would be perfect for my prayer room. I enjoy reading your posts regularly. Thank you for your ministry. Sorry, I am very new to FB and couldn’t figure out how to get any numbers with the url. Thanks so much for all that you share with us. I get so encouraged and I love all the Bible studies. I would love to have the apron but either is ok they are both beautiful. Thanks again and God continue to bless you!! Not sure what my URL is I’m not tech savvy. I am always cooking but also breastfeeding yoga balancing one foot up and down and stirring and texting and talking and teaching and painting so an apron is pointless when the baby covers my chest and back all the time making my arms stronger than the Hulk. I LOVE the cross. How beautiful!! Tea towels for sure for sure for sure as comedian Anita Renfroe says. I heard her at a women’s night out last Friday. For SURE would put the cross in my bedroom. I read your marriage posts every day and forwarded them to my deployed husband who recently came home from being overseas for over a year. You, sweet woman, are a hero to many. I would love to win the apron and towels. I love to cook for my family and friends.. I am looking forward to this bible study. I love you Bible Studies and can’t wait to get into this one! I like both gifts but would prefer the apron. Thank you so much for your desire to teach! I’d love to win the apron! I love love love your site and your daughter’s art, and your bible studies are always spot on for me. The Cross would look divine on my wall! I would love the cross for my prayer/office room. Posted on Facebook and I follow u.https://www.facebook.com/noelle.gore.3 thank u for giving us a chance to win. Either gift would be amazing because it would be a reminder for me to slow down and pray. Both would be great, but my preference would be for the cross. I just recently started trying to collect crosses for my walls & have exactly two. This would make three & what a beautiful addition it would be. Oops! Forgot the URL for my facebook share. I would love to win the apron. I have known and celebrated the feasts or fiestas as God”s holy days for 4 years now. They explain Jesus plan of salvation from past to through the present to the future and are memorials also of what He has done. I appreciate your bible studies and marriage prayers. They help me greatly. I love the apron & tea towels! I can’t wait to dive in to your book! Posted the paragraph to my facebook page. Although I love all the items, I would love to win the cross. These are both lovely prizes and I would be happy with either! I love aprons and tea towels and I collect crosses. I have a wall full of them! I need to post a picture to your FB page to show you! I would love either prize, but since I’m in need of a new apron, I guess I would choose the apron over the cross. I would love the cross, a beautiful reminder of everything important and that has a new meaning for me. I am dealing with the stress and anxiety of Hurricane Maria… Prayers are welcome for me, my family and my beautiful island Puerto Rico. Thanks, God bless! I am going through some personal problems, And I would really like to win the cross!! Either! They’re both amazing and I know exactly how I would utilize either. Bless you for the opportunity. Posted on my Facebook page. Would love to win that cross. The apron and tea towels would be a delight to win! The cross is gorgeous but I love to bake and could use a new apron. I would be happy with either but if I had to choose it would be the apron! I would love to have either one! The cross is perfect for my chaotic office! I would love the cross. We have crosses hanging all over our house and I think this cross would be a wonderful addition. Would love to win the apron.. but I love the tea towels too.. posted on facebook.. looking forward to reading this study.. 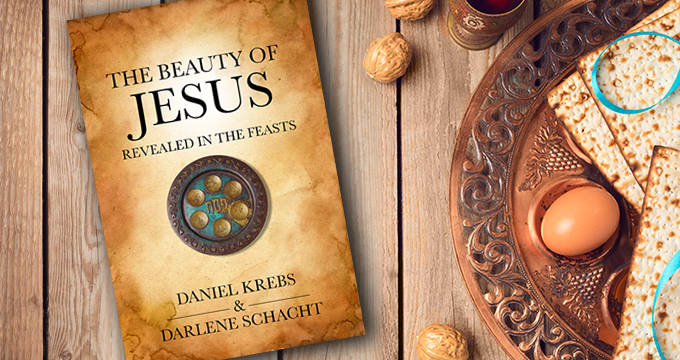 The Feasts are sooo important…what a great new book opportunity!! I emailed the paragraph to some friends. I would love either one. I do not see anywhere to put a private URL? You don’t put your private info in open form. I’d love either. It would just be a blessing to win. I also think the real blessing is the number of lives possibly touched by us sharing about this book. I am in love with the cross! Hope I can win! Either would be a blessing. I love the cross, but either would be great. All the prizes are so cute! I especially like the apron and towels! I would be honored to win either one of these great prizes. The apron and tea towels are adorable! I’d love those. The wood cross is gorgeous! I’d love to have this on my living room wall!! Either – but the apron would be preferred. I would love to win the tea towel set. I LOVE both items! My first choice would be the cross. I already have the perfect place in mind to hang it too, right by the door. You would see it while you’re walking in, while you’re leaving and also relaxing in the living room. It would be a constant reminder that God loves us and will always take care of our family. I LOVE both items and would be very happy with either of them. These are both nice items. I would love having the cross mostly! But I would also use the apron and tea towels. Thanks for sponsoring this nice giveaway. I just received my book and study guide from Amazon. I am so excited! I would love either one. I don’t have an apron so maybe that would be my first choice. The cross is beautiful though!!! Thank you for this fun offer! I would love to win either of these prizes. They are both awesome and would be pleased with either one but that cross is amazing. Thanks for your contest. I really like both, but if I have to choose, I’d pick the cross. Would love the Word Cross! That is such a hard choice! They are all so pretty! Apron 1st, Cross 2nd and Tea towels 3rd. I would love the cross! A daily symbol to physically see and reminder each time I look at it! I would love to win the cross with all the words of encouragement on it, my husband passed away in July and i feel like I’m struggling in my walk with Christ. Today I decided to start back on my journal. That is what brought me to this site. I love all your encouragements!! I would like to win the cross because it serves as a constant reminder of the truth about Jesus. Sometimes you don’t have the energy, the time or the willingness to open the bible and read, but having this visible cross allows you to look at it and feel at peace. Not to mention it is a beautiful cross and would look beautiful in anyones home. I would love either gift if I win. I love your stuff.